I love my job as a photographer! I love meeting new people and having the opportunity to witness their best selves. It's such a blessing to photograph sweet moments that bring tears to mother's eyes and funny moments that bring laughter. Art evokes emotion, and my art is intended to evoke emotions of happiness and nostalgia. When people see my work I want them to feel a little lighter, and a little happier. In the world today there is enough darkness to go around, why not shed light on the joy that exists here too? I just have to say thank you to my wonderful clients who hire and trust me to capture their moments. Without you, I couldn't do what I do. I take the opportunity seriously and put 200% into my work. Hats off to 2014, a wonderful year! This video is a snapshot of some of my favorite moments from 2014. I wanted to include so much more, but alas sometimes less is more! Kinnickinnic Backpack Program Fundraiser a Success! I just can't say enough how happy I am that this fundraiser turned out so well! I have to say a big thank you to Riley's Growing in Style for hosting my fundraiser in their shop! There was a great turn out! Watch the video to see some fun images from the various sessions and to find out how much Our Neighbors Place received as a result! I love that the backpack program exists here in River Falls! What a great program to help kids who are in need of food! I want to give back to our amazing community this year by having a fund raiser for this wonderful program! 100% of the proceeds will go to the Backpack Program! I will be at Riley's Growing in Style on Nov 22 from 10-4 pm doing 15 minute Christmas themed minis for $35! 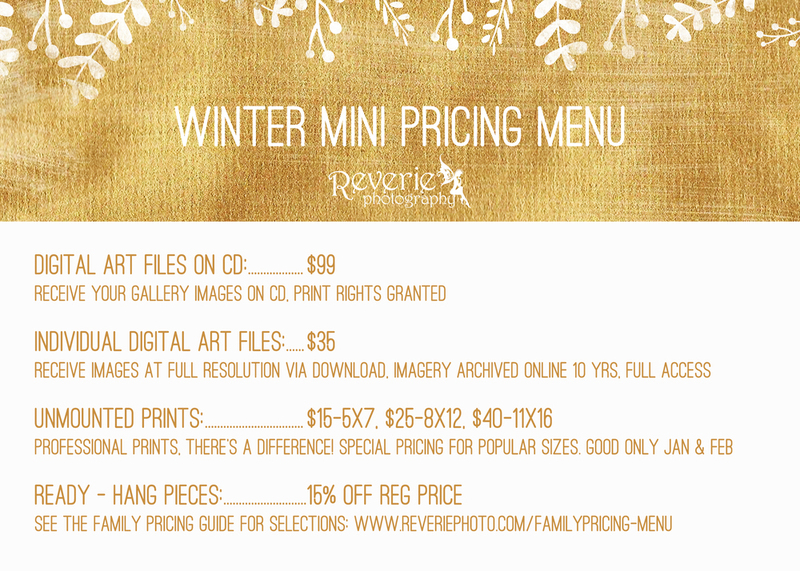 You'll receive up to (3) 5x7 digital files to use for your 2014 Holiday card! If you mention my blogpost I'll throw in a Christmas Timeline cover photo showing off your Holiday pic(s) from your session! These are by appointment only. Payment will be due upon booking of your session. Each session will last 15 minutes. If you want longer, you can purchase additional 15 minute blocks back to back ($35 each) or at various time slots for the day. There are 3 sessions per hour. Each starting at the top of the hour with a 5 minute break between each session. I recommend you arriving 5 minutes early to your session so no one gets held up behind you. Dress up for Christmas and come have your picture or kid's picture taken for a great cause! Please note there will be space for possibly up to 5 people max in one picture. Call now to book your appointment and help fill the needs of our community's youngest members! As a photographer I know how important it is to have happy clients and do all in my power to make sure they are having the best experience! I love when my clients return again and again. I love when my clients refer their friends, it is the highest form of a compliment to me! Soooo.... I've decided to give my clients a little kickback for giving me great reviews to their friends. I know they don't have to, and it means so much when they do! Clients can request referral cards to give out to their friends. It's very simple. You write your name on the back of the card. Your friend gets a complimentary 8 x 12 deluxe print ($80 value) with their regularly priced session. When three referrals from the same client has scheduled and completed their session with Reverie, the referring client receives a complimentary sitting ($175 value) as a thank you! It's just Reverie's way of saying thanks, and letting my clients know that I appreciate them and their loyalty. If you want some referral cards please let me know via email info@reveriephoto.com. I think everyone has heard the phrase "Take time to smell the flowers". In essence we're supposed to take the time to pay attention and give time to the things that are beautiful in our lives. What those things may be differ from person to person. For me, in my realm as a photographer, I take this notion seriously. I don't often offer "mini-sessions" because my fear is that it may not be enough time. My session rate covers up to 2.5 hours (3 for high school seniors). Some may exclaim, "What?! Who would need that amount of time?!". It is a valid question, but once you understand why, then perhaps it'll make sense. 1.) With young families it takes time to allow small children to relax and be themselves. They are able to take brief breaks if they need to. I will often do silly things or play silly games with young ones to help them be natural. We move around a lot because they have short attention spans. I had a session with a young family and the mom told me she hadn't thought they'd need that much time, but by the end of the session we had used up the time, and she thought differently. 2.) Locations. I love a unique setting for my clientele. It's so exciting to go to different places that represent the family and photograph them in their comfort zone, whether it be at a beach or in the middle of a city setting. I offer more than one location for the soul purpose of variety and fun! The session time allows for variety of setting and creativity to unfold. 3.) Quality, Variety, Quantity. With available time, so many opportunities for spontaneous moments pop up. Once my client feels settled in and comfortable they start to be themselves and beautiful genuine interaction takes place. Sometimes I may give gentle direction, and other times I just observe and photograph in between the direction. With more time comes more choices. I'm able to capture more, therefore my client has an awesome variety of images to pick from. So why does the time matter? Because my clients matter! I believe quality work requires quality time, and that's what I offer! So when looking for a photographer, be sure they want to give you their time.